Should you visit Shark Bay and Monkey Mia? The peninsula that contains the Shark Bay UNESCO World Heritage Site and Monkey Mia Resort is an oft-mentioned destination in Western Australia. Lonely Planet and many other travel guides rave about Shark Bay, one of the few places in the world that satisfies all 4 of the natural criteria to be a World Heritage Site. However, if you read about the destination online, the reviews are often quite to the contrary. 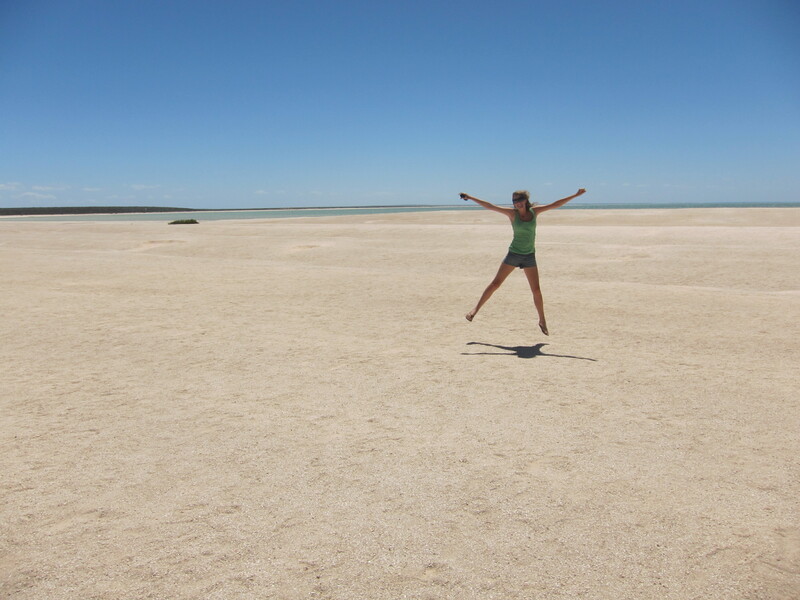 When I was researching the Coral Coast for our road trip, it seemed like every blog and review I read about Shark Bay/Monkey Mia (pronounced My-a) was negative. Most people called it overrated/over-touristed/disappointing/boring/lame and many other negative things. A lot of them remarked that it was far from worth the almost 300km roundtrip detour (off the Northwest Coastal Highway) it required. So when planning our road trip, we concluded we would skip the peninsula on the way up so we could have more time to spend at Ningaloo, and probably give it a miss altogether unless we had the extra time on the way back down. In the end, despite how much we love-love-loved Ningaloo, we had grown tired of snorkeling and beach bumming quickly (which was most of what there was to do in Exmouth/Coral Bay since a recent cyclone had wiped out many of the roads leading to hiking areas) and decided we had the time to check the area out. While most people seem to focus on the dolphins at Monkey Mia — and in fact I was told there was absolutely no reason to head out to Shark Bay and Monkey Mia at all unless I was super-obsessed with dolphin — there are actually a lot of cool things to see in the area, and even more than we were able to do if you have a 4WD. Francois Peron National Park is supposed to be incredible, but you can only access it and really enjoy it if you have a 4WD vehicle or take a tour. In fact, there are some cool-looking ATV day tours if you have the money to spring for it. But first, let’s talk about those dolphins. Because of all that negative talk, I had actually decided I didn’t care at all about the dolphins and wasn’t keen on seeing them. However, I did want to see dugongs so we ended up still having to go to Monkey Mia Resort (turns out you still have to go there, and pay to get in, to go on the dugong spotting tours). The tour was supposed to be leaving at 10:30 or 11am, so we headed over around 9:30 as we were assured we would have no trouble booking on the spot. That was when we found out we had to pay to even get to the jetty, which set us back $6 each, but because it was later in the morning (and we had missed the first two — of a max of three — dolphin feedings, which again is the main reason people go to Monkey Mia) we were told our entrance tickets would be good for the next two days if we wanted to come back again the next morning. It turned out we’d have to come back, as we found out that the tour boat we’d wanted to go on wasn’t running that day due to a mechanical problem. So since we were there, we figured we’d at least hang out on the beach and look out for dolphins. We were told it was unlikely they’d come back into shore — the rest of the week they’d only come in twice to eat and they’d already done two feedings that morning. We hung out anyway, and after 30 or 40 minutes the dolphins, which had been swimming around not too far out from shore, suddenly started to come in. About five of us gathered down at the shore, and even once all the dolphins (around 14 — a large amount at once, we were told!) were in, swimming around, the group only grew to maybe 8 or 9 people. Not at all the huge crowd of tourists I’d been expecting. 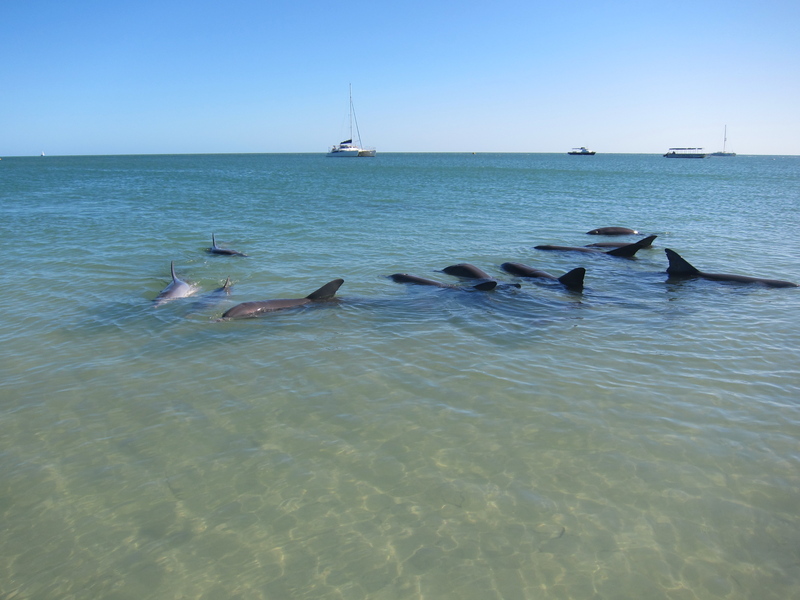 The volunteers assured us we were lucky, as it isn’t too often the dolphins actually outnumber the people! Even the next morning, when we saw the earlier feeding, there weren’t that many people there. There was definitely more of a crowd, but I didn’t feel it was ridiculously large in any way. Perhaps we had good timing in a lower season (this was in early March), who knows. 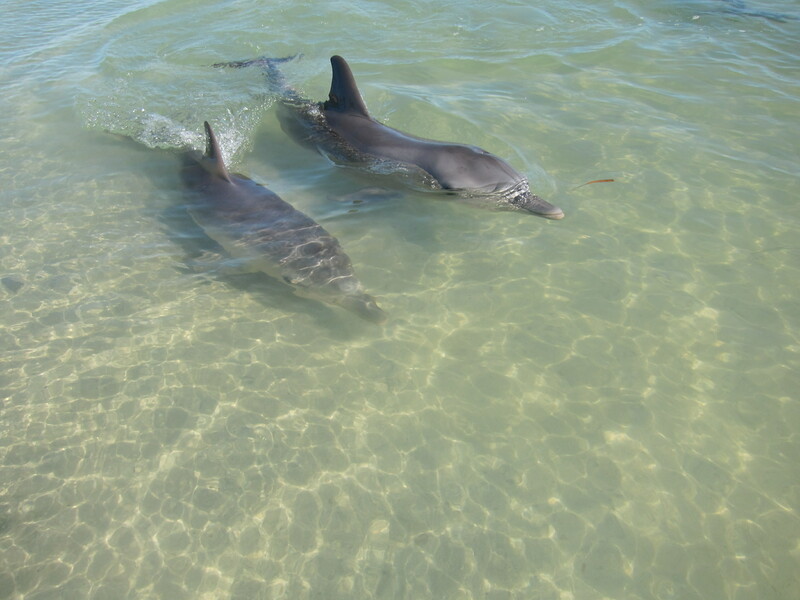 The dolphins just swam around, one dolphin (aged 35!) and her son particularly liked to swim up around us — flipping to her side to get a good look at us and give us what looked like a big smile. The volunteer guides shared a lot of interesting information with us — a lot of things I didn’t know and some I kind of wish I didn’t! (Let’s just say I didn’t realize what jerks male dolphins are!) After a while they brought out buckets of fish and a few people (Oscar included) were selected to come feed the dolphins. Only a few select dolphins are allowed to be fed, and even still they are only allowed a small amount of fish each day — I believe only up to 10% of their daily diet. It was necessary to add these regulations as back in the day, when anyone could just buy some fish and feed the dolphins willy-nilly, some of the dolphins would spend all day at the beach and ignore their babies (not teaching them how to fish and survive on their own!) — who would then die. Very sad. While I’ve seen dolphins plenty of times before, and even touched them before at Sea World as a kid, there was something very special and cool about seeing real, wild dolphins swimming right up around you. It’s interesting to see how playful they are without being taught tricks or being at all domesticated. To see the mothers and their babies, to see how they interact. How they swim together, how some like each other and some don’t. It was quite fascinating. I didn’t think I would be impressed, but I definitely was. And dolphins aside, Monkey Mia is a beautiful spot. For us, it was kind of nice to be at a “resort” and have a bit of a vacation-y feel to our trip. 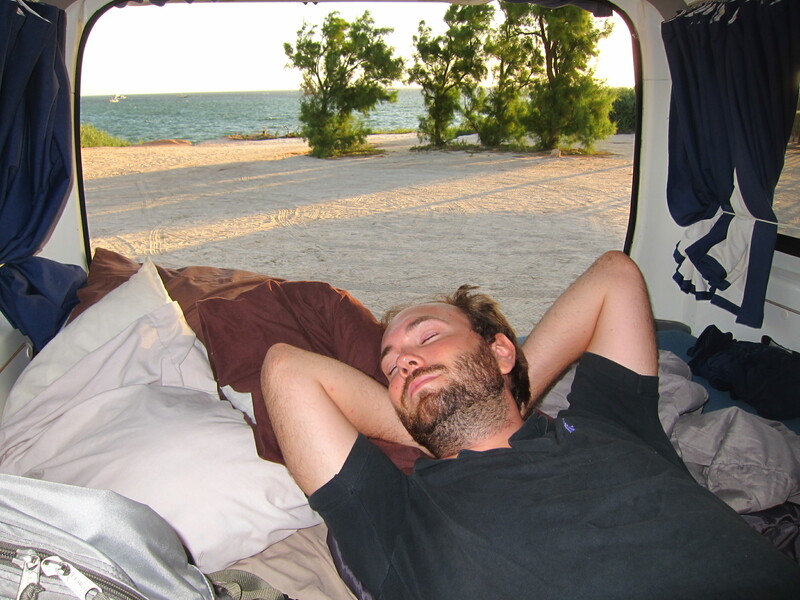 We spent that night at the resort’s caravan park ($35/night – they have everything from villas to the caravan park and campground) and were able to make use of the private beach, pool and hot tub, and even grab a beer at the resort bar, watching the sunset over the water. Nice. 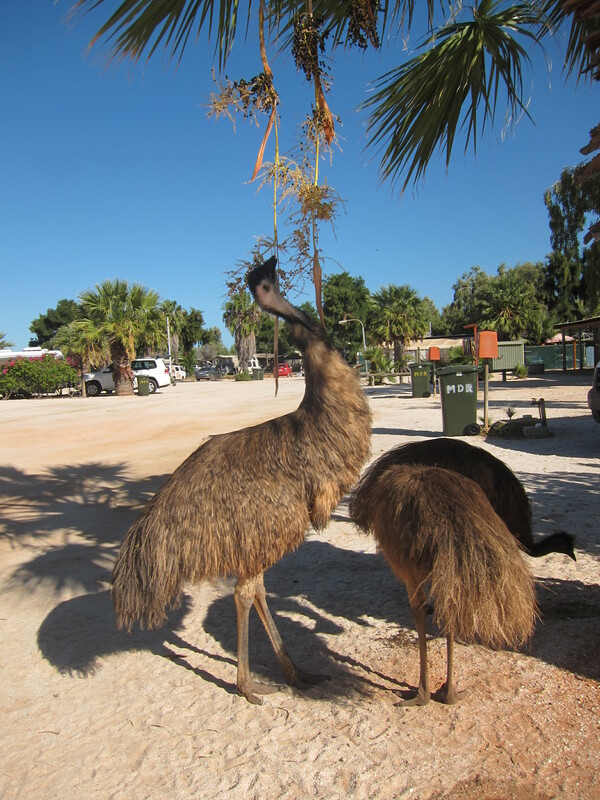 There was also a little family of emus running around, which was quite fun. They came to check out our spot in the caravan park right after we settled in, and all us caravanners had a good time watching them run around and check out our vans. 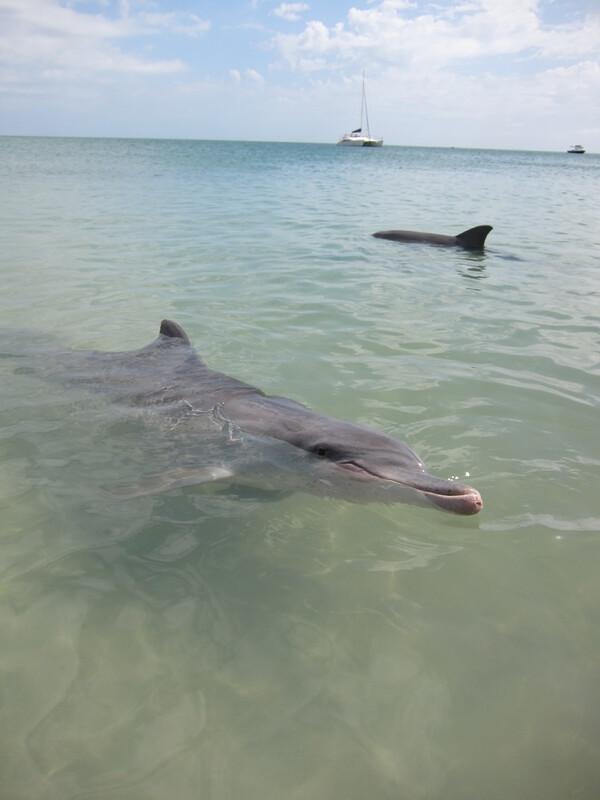 However, as I said, there is a lot more to Shark Bay than just the dolphins at Monkey Mia. 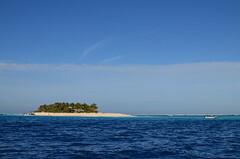 First, as I said, there are boat tours where you can see dugongs, manta rays, sea turtles and more. On our tour (on the Aristocat 2 – there were only six of us!) 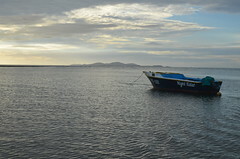 we saw a few dugongs, including a mother and baby, but apparently we had just missed better conditions (there’d been some rain and strong currents churning up the water) so it was harder to find and see them. Shark Bay has the largest area of seagrass and the largest amount of seagrass species in one area in the world, so it attracts tons of dugongs — the largest population of them in the world. We had a better time spotting sea turtles — including some huge ones that moved insanely fast! We even had some dolphins come along and playfully race the boat. In fact, the one thing we didn’t see in Shark Bay were sharks. 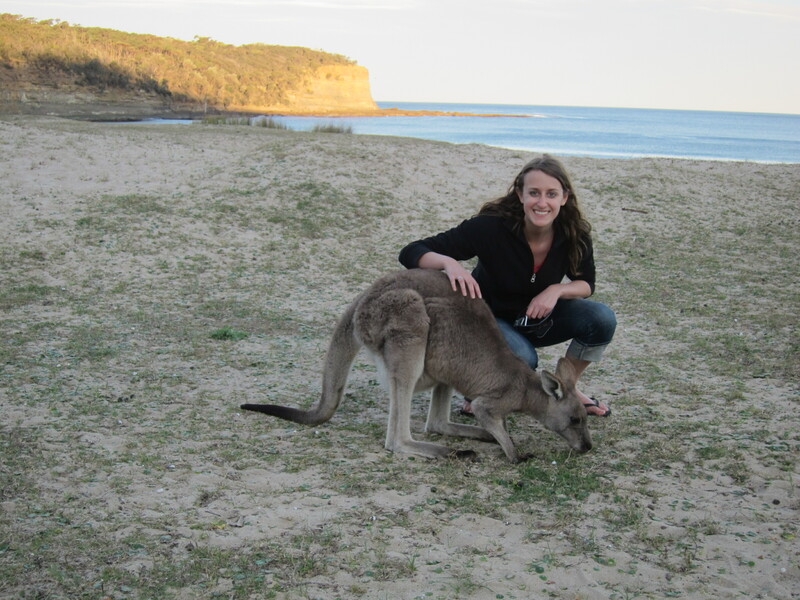 No kangaroos at Kangaroo Island, no sharks at Shark Bay, definitely no monkeys at Monkey Mia, and no emus at Emu Bay (or Emu Beach) — funny how Australia seems to work that way! One of the other things Shark Bay is quite famous for are the stromatolites at Hamelin Pool. Stromatolites, often called “living fossils,” are one of the oldest living organisms in the world. (Shark Bay’s particular stromatolites are around 3,000 years old.) While that’s a cool fact, I have to be honest and say they aren’t exactly the most amazing things to look at. We pretty much had our glimpse and moved on, as it was hot and the flies were aplenty when we visited Hamelin Pool. Also, if you’re really keen to see stromatolites you don’t necessarily need to go all the way up to Shark Bay to see them. They can also be seen in Cervantes. For me, one of the real highlights was Shell Beach. It is exactly what it says, a beach made of shells. Cockle shells, to be exact, and it is believed to be at least 10m (that’s 30 ft!) deep of just shells. It’s one of only two beaches in the world made entirely of shells. (Anyone know the other one? I can’t seem to figure that out!) It’s hard to really explain this — it’s something you just have to see for yourself. And feel. And walk on. And the lagoon is also super cool. You can just walk out for what feels like forever — it’s very shallow. And very saline. 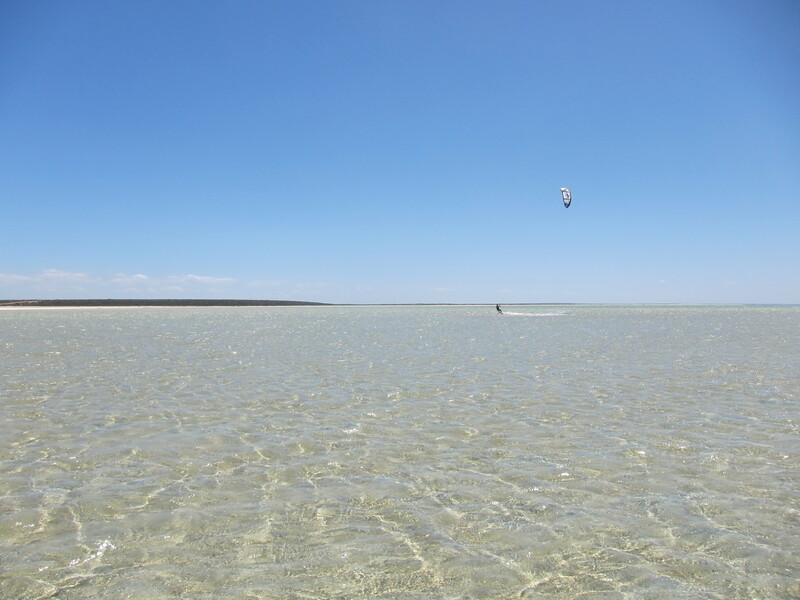 When we visited there was a guy kite surfing on it and it looked very cool. If I knew how to kite surf I think I’d definitely make a point to do it there. Of course you should also make a stop in pretty little Denham, the most westerly city in Australia. If you aren’t keen on staying at Monkey Mia Resort, this is the place to stay. The caravan park at the end of the road into Denham, Seaside Tourist Park, has great caravan sites (we paid $32 with Top Tourist Discount) overlooking the water. It’s also a good spot to get petrol and do some grocery shopping. 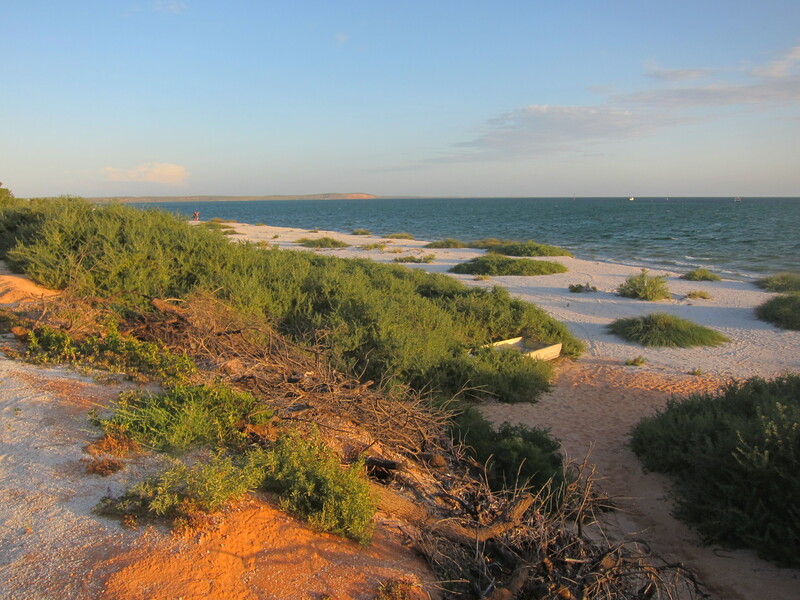 If all that isn’t enough, there are plenty of other things to see and do and places to explore (like Dirk Hartog Island) which I may not be able to talk about firsthand, but can be read about in any of the Shark Bay tourist brochures you’re sure to pick up along the way. 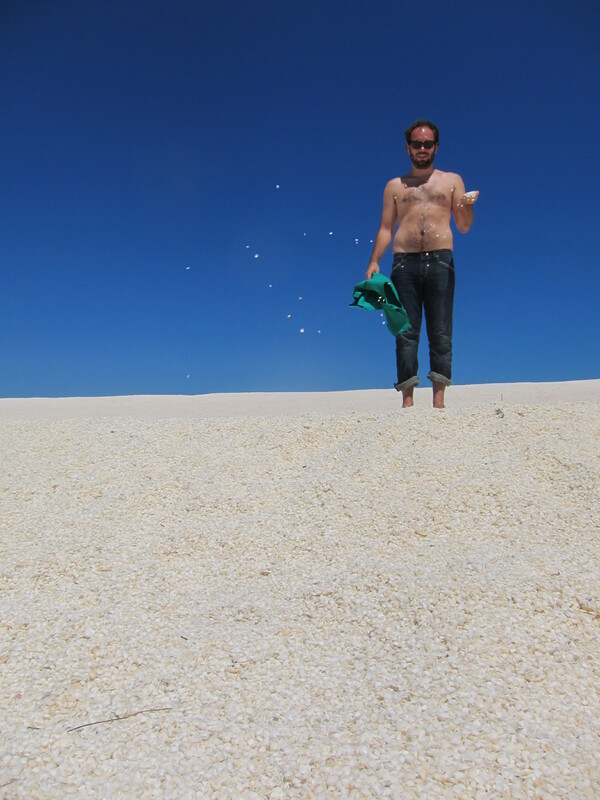 And finally, to answer this post’s primary question — in my own humble opinion — yes, you should visit Shark Bay! Be sure to manage your expectations, perhaps check on whether it’s the high or low season, but it is certainly a worthwhile addition to any West Coast Road Trip. Good honest review. But not sure if, now, after two years, it is still worth visiting. Anyone with any comments on recent visit?